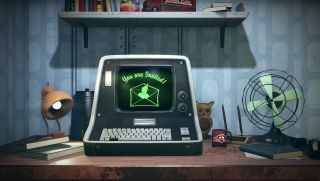 Bethesda has confirmed that Fallout 76 will not support cross-platform play. Following the news that Sony is finally enabling cross-play for Fortnite, Bethesda vice president Pete Hines retweeted the news on Twitter accompanied by the clap emoji. This caused fans to assume Hines was hinting at possible cross-play for Fallout 76. However, Hines (who we interviewed at Gamescom around the launch of the Elder Scrolls: Blades mobile game) then tweeted to clarify that upcoming online multiplayer title Fallout 76 will not support cross-play 'for a number of reasons'. "I have no idea if it ever will," Hines wrote. "But I assure you it is not on our radar right now as we focus on B.E.T.A. and Launch." Although Hines did not specify what these reasons are, it's possible cross-play will not be supported due to the size of Fallout 76 (it's meant to be four times larger than Fallout 4) and how much strain the feature would have on the servers. Fallout 76 is due to launch for Xbox One, PC and PS4 on November 14.